Local governments have been grappling with property taxes since 1990 when Measure 5 and Measure 50 went into effect. While Measure 5 simply limited the tax rates used in calculating taxes imposed, Measure 50 changed the conceptual definitions of both assessed values and tax rates. The drumbeat for property tax reform in Oregon has grown louder in the last few years; however, those efforts have produced limited results. ELGL believes one reason for that is the lack of creativity shown in framing the issue to the public. Proponents of property tax reform often get bogged down in government jargon when making the case for reform. Luckily, in September 2013, a creative and effective way of communicating the message was produced by Deschutes County Assessor, Scot Langton and Anna Johnson, Deschutes County, Public Communications Coordinator. Here is how the “Property Tax Fairy” came to life. A member of our local theater community, Holy Hamilton is the Property Tax Fairy, The homeowners in the video are Deschutes County employees and their immediate family members. Who created the “Property Tax Fairy?” What were the other ideas discussed? Deschutes County released the video in late August. What has been the reaction? Positive? Negative? Number of web hits on the video? Was it difficult to get elected officials and staff on the same page when you were developing the video? No it wasn’t difficult. I’m the elected official over this office and made the decision to move this forward; of course we did work with other county departments and kept Administration and the Commissioners informed and valued their thoughts. We try to promote an environment in our office where our staff can openly offer ideas on how we can preform our work better and offer better customer service. We continually kick around ideas of how to connect with our customer more effectively; so when a staff member suggested a video we just sort of ran with that idea. What are two or three property tax issues that the public struggles to understand? If you could wave the “Property Tax Fairy’s” magic wand, tell us three changes you would make to the current property tax structure. I’ve been pushing hard over the years that we as a State need to create a framework where all stakeholders (private and public) can come to the table to discuss government services, what level the service should be, and then how best to pay for it. I honestly feel this is more then just a property tax issue. As an assessor we are often in the middle between the taxing districts who provide the service and the taxpayer who is footing the bill. I have very seldom heard a taxing district say that can continue to function in the long term given the limitations (basically their cost of providing the base service increases annually at a greater rate then their income) and the tax payer who I’ve seldom heard say they think they are paying too little tax. I think we need a champion that is a well respected and well recognized that is willing to take the political risk of bringing a wide represented group together to dump all forms of taxation on the table for discussion. Once types and levels of service are identified then figure out what makes the most sense to fund – if some of the current forms of taxation stay on the table and are not incorporated that’s fine. Then that group needs to take it on the road to educate the general public on what it means and what are the impacts before having them vote on it. Property tax reform has been on the legislative agenda of cities and counties for many years. In your opinion, have local governments been effective at communicating the message? What grade would give local governments? Interesting question. It seems like when polled nation wide property taxes are the least liked tax, but they are also the tax that the local individual has the most influence over. I always find it interesting that the voters will pass a number of different money measures but then be upset at the increases in their tax bill. Both Measure 5 and Measure 50 in my opinion were results of this. So I’m really not sure why the disconnect; but definitely something that those of us in government should be trying to figure out and address. What is your prediction for when substantial property tax reform will occur in Oregon? I hate to be a pessimist but if history is any indication then we’ll unfortunately be in a reactive instead of proactive roll with a voter initiated constitutional amendment at what point enough folks are frustrated enough to say it’s time for a change. I’d really like to break that cycle and be proactive and would be very willing to participate in that. I think it would be a safe bet that if the Portland/Metro area was to experience what is about to occur in Central Oregon that there would be some sort of tax reform/revolt this year. 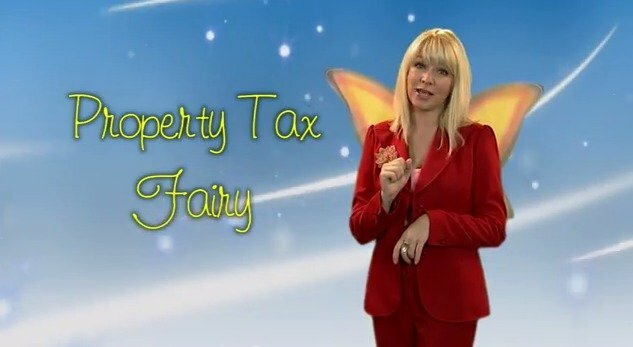 The “Property Tax Fairy” was genius. What is in the works for a sequel? The property tax fairy and the graph it tool will be promoted next through a 60 second TV ad campaign, radio, and TV interviews and an upcoming media release. Potentially a sequel, first we need to see how effective this is and how helpful our customers find it. We will be mailing property tax statements in October and will probably have a much better idea than. If others have ideas on how best to connect with our customers please be sure to let us know.